Plater walls (drywall) is horrible for hanging picture, right. A nail or screw just will not hold and will only make a mess! Well, that kind of right. It may be that you are not using the right kind of screws or there are other options. Did you know that there are special screws for plaster walls? There are! But we will get to those later. 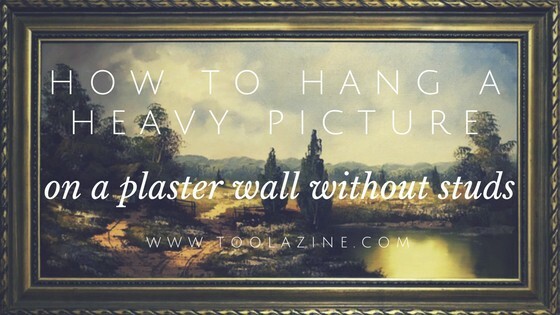 Let’s start from the start so you will know how to hang a heavy picture on a plaster wall (drywall) with no studs or drilling. You will make a hole though you will not need to drill it. Most people hand paintings on a wall. However, different areas on each wall may be more or less suitable to hang paintings. Aesthetics (if it will look nice) is a major factor. Ideally, you want to hang the painting on a wall where a stud, as that is the most secure option for anchoring the hook into the wall. You may also want to consider handing paintings away from sources of heat, moisture and direct sunlight. If you do have studs it is best to hang things from the studs. Fasteners that are put into studs are more secure and stronger than those that are not put into a stud. For this reason, heavy painting and other heavy things should be hung fastened to a stud. To find wall studs, keep knocking on the wall and move along until you feel or hear something solid behind the plaster (drywall). If you can’t confirm where your studs are using this method there are electronic stud finders that you can use to find the studs. The Zircon stud finder is a quality option and a reasonable price. The Zircon stud finder is available on Amazon, check the price here. A stud finder – ideal for find studs when you want to hang a painting. You can either drill and then screw a hook into the stud. If screwing a hook into the stud you will want to make sure that the drill bit is smaller than the screw thread. The drill bit should be about the same size or a bit smaller than the screw without the thread. If you need a cheap drill check out my review of the best cordless drills on a budget. You may be interested in the best cordless drill under $50, it even comes with a stud finder. Drill a hole angling the hole so that it angles down into the stud, similar to if you were nailing into the stud and don’t want the picture wire to slip off the nail. Screw in your hook and hang the painting. This is ideal for hanging large heavy paintings or other heavy items. It will spread the weight over a larger area of the wall in comparison to a normal screw. There are two basic types of toggles, strap toggles and bolt toggles. With a plaster wall toggle you will need to drill a hole in your plaster wall and push part of it through. The major issue with this type of product for h anging a painting is that if you decide to take it down. you will have an unsightly hole in the wall there. It is also recommended that you use a drill to make a hole so that the hold is rather neat. Drywall anchor screws are a good option for hanging even heavy paintings when you do not want to drill. The only tool that you need to install them is a screwdriver. If you end up taking down the painting the white part of the anchor can be left in the wall and is quite neat, compared to a bolt toggle system. Even though they do not look like they can hold much weight, some of these paster anchor screws can hold up to about 45lb each. If you have a very heavy item you could always put in several of them and spread the weight between them. If you are not sure which option to choose you can purchase drywall anchor assortment kit, check out the different options when you have them in your hand and then choose.